Diagnosis of a neurological disease often brings a heavy emotional burden that includes fear and depression. Setting up a support system is an essential part of managing these and other serious health conditions. Support can be found in family and friends, hospitals and clinics, online, through telephone hotlines and more. There is a link between some neurologic conditions and suicidal ideation and behavior. Whether suffering from years of depression or recently diagnosed with a life-changing medical condition, today there are many places an individual can hopefully find needed support, according to Dianna Malkowski, physician assistant, nutritionist and professional adviser for The CareGiver Partnership. “While we’ll never know the extent of the relationship between Robin Williams’ diagnosis of Parkinson’s and his suicide, there is a link between some neurological conditions and suicidal ideation and behavior,” says Dianna Malkowki, physician assistant, nutritionist and professional adviser for The CareGiver Partnership. Of the more than 600 neurological diseases in existence, major types include Huntington’s, muscular dystrophy, spinal bifida, Parkinson’s and Alzheimer’s. 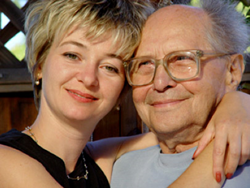 “Having a support system in place — ideally, one that includes family and friends, health care providers, and other patients with similar experiences — can be the difference between simply living with a health condition and successfully managing it while maintaining or improving quality of life,” adds Malkowski. Malkowski says support systems can be found in many places, and technology now allows those who cannot or do not wish to physically attend support groups to find help and camaraderie online. While those diagnosed with a health condition often don’t want to worry loved ones, it’s beneficial to be surrounded by friends and family who know what a person is going through and who can provide physical and emotional support. Those comfortable with sharing may look for additional support on social networks. Hospitals and clinics can put patients in touch with support groups based on an individual’s needs. Patients can start by asking their health care or insurance providers or visiting their web sites. Today, there are support forums and online groups on nearly any topic. An online search is a great place to start. Because online forums typically can be viewed by the public, users should avoid posting personally identifying information and check settings to ensure details like names and e-mail addresses aren’t available to other viewers. Seniors and caregivers can find support at The CareGiver Partnership’s web site, including a continually updated blog on various topics related to aging and a resource library of more than 1,500 links to nonprofits, government, and health care organizations. In addition to its blog readership, The CareGiver Partnership has more than 12,000 followers combined on Facebook, Twitter and Pinterest; these social media links can be accessed from its home page. It’s essential that people suffering from depression seek professional help as soon as possible. Those in immediate danger should call 911. Those not in immediate danger but who need to talk with someone about suicidal feelings should call one of two national suicide prevention lines: 1-800-SUICIDE (1-800-784-2433) or 1-800-273-TALK (1-800-273-8255). Visit suicide.org for more information. Dianna Malkowski is a Board Certified Physician Assistant and Mayo Clinic trained nutritionist specializing in diabetes, cancer, wound healing, therapeutic diets and nutrition support. In addition to her frequent expert contributions to The CareGiver Partnership blog, she has authored 350 Ezine articles. She serves on the board of professional advisors for The CareGiver Partnership and enjoys working with patients and caregivers alike.